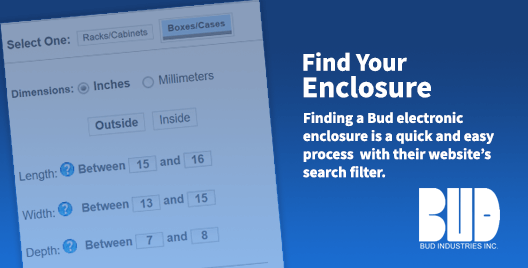 Find the right enclosure easily with Bud's search tool! 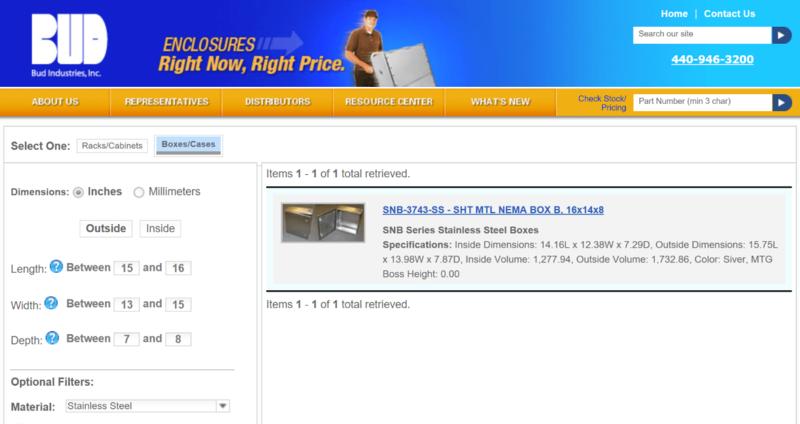 » HHP Associates, Inc.
Find the right enclosure easily with Bud’s search tool! 18 Oct Find the right enclosure easily with Bud’s search tool! Finding a Bud Industries electronic enclosure is a quick and easy process that can be done 24/7. Just check out all of the great features on Bud’s website. Let’s say you are looking for a stainless steel NEMA box that is roughly 16” x 14” x 8”. Just go to Bud’s website at www.budind.com and in the right hand upper part of the page, note the search by size feature. It is easy to load a product size range. All appropriate products will appear with their photos to assist you in making a decision. In this case, since the stainless steel material has been selected, SNB-3743-SS is the proper product. The product link drills down to a page that includes detailed product information, product videos and drawings in both PDF and DXF.